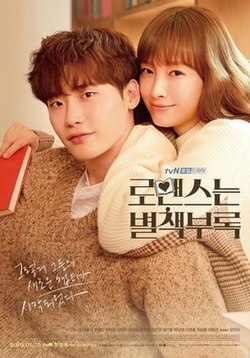 Romance Is a Bonus Book (Hangul: 로맨스는 별책부록; RR: Romaenseuneun Byeolchaekburok) is a South Korean television series starring Lee Na-young and Lee Jong-suk. It aired from January 26 to March 17, 2019 on tvN. Cha Eun Ho is a successful author and a senior editor at a book publishing company. Kang Dan-i is a mother and former successful advertising executive. When Cha Eun Ho was a child, Kang Dan-i saved him from an accident and was injured. Cha Eun Ho helped her recuperate and they have been close friends ever since. When Kang Dan-i goes through a major life change and tries to re-enter the professional world, their lives become even more connected. They face personal and professional challenges as they slowly start to realize their true feelings for each other. A former rising star and a current unemployed divorcee who later joins a publishing company as a temporary worker. A brilliant writer who is also the company’s youngest editor-in-chief. The Lead Content Development Editor. The first script reading was held on October 26, 2018 with the attendance of the cast and crew. This series marks Lee Na-young's return to small screen after nine years and Lee Jong-suk's first romantic comedy. On January 21, 2019, a press conference was held to promote the series with the attendance of lead cast. Lee Jong-suk finished filming his scenes for the series on February 27, 2019 due to his military service enlistment on March 8. January 27, 2019 You Were Hiding In My House? March 2, 2019 We Have To Be Together, Why Do You Want To Break Up? March 3, 2019 How About A Title For Your First Date? March 9, 2019 Did It Hurt Because Of Me? March 10, 2019 You Know Me, Right? March 17, 2019 As If I Had Met You In a Book and Received Warm Comfort..
^ ROMANCE IS A BONUS BOOK [티저] 그렇게 우리의 새로운 챕터가 시작되었다! (이나영 Voice) 로맨스는 별책부록 190126 EP.0. YouTube (in Korean). tvN Drama. Retrieved December 30, 2018. ^ Dong Sun-hwa (15 October 2018). "Lee Jong-suk, Lee Na-young to star in upcoming drama". The Korea Times. ^ ""9년 만에 드라마 복귀"..이나영 '로맨스는 별책부록' 확정, 이종석과 호흡". Korea Kyungje (in Korean). 15 October 2018. ^ "Lee Na-young and Lee Jong-suk to show romance in publishing industry in new rom-com". Kpop Herald. 21 January 2019. ^ "Lee Na-young to Appear in Rom-Com Series with Lee Jong-suk". The Chosun Ilbo. 22 January 2019. ^ "'Romance Is A Bonus Book' popular on online platforms". The Korea Times. February 22, 2018. ^ "Lee Na-young returns to small screen with rom-com after 9 years". Kpop Herald. 15 October 2018. ^ "Lee Jong-suk cast for new tvN series set to air early next year". Yonhap News Agency. September 28, 2018. ^ "Lee Jong-suk to star in tvN rom-com". Kpop Herald. September 28, 2018. ^ Yoo Cheong-hee (November 2, 2018). "배우 정유진, tvN '로맨스는 별책부록' 캐스팅…출중한 편집자 役". TenAsia (in Korean). ^ "위하준, '로맨스는 별책부록' 출연…이나영X이종석과 호흡[공식]". Sports Seoul (in Korean). November 12, 2018. ^ Baek Ji-eun (October 30, 2018). "[단독] 김태우, '로맨스별책부록' 출연확정…이종석과 브로맨스". Sports Chosun (in Korean). ^ Myung Hee-sook (October 24, 2018). "김유미, '로맨스는 별책부록' 확정 '4년만의 복귀작' [공식]". My Daily (in Korean). ^ "조한철, '로맨스는 별책부록' 출연확정…이종석·이나영과 호흡 [공식입장]". Sports Donga (in Korean). November 9, 2018. ^ "박규영, '로맨스는 별책부록' 출연확정..이나영X이종석과 호흡[공식입장]". Osen (in Korean). November 12, 2018. ^ "최승윤, '로맨스는 별책부록' 캐스팅… '악역 벗고 순한 이미지로 등장!'". Maeil (in Korean). January 22, 2019. ^ "'로맨스는 별책부록' 이나영X이종석, 첫 만남부터 꿀케미 터진 대본 리딩 현장". SE Daily (in Korean). 13 November 2018. ^ Park Soo-in (13 November 2018). "'로맨스는 별책부록' 이나영X이종석, 대본리딩부터 이렇게 설렐 줄은". Newsen (in Korean). ^ Yoon Hyo-jung (15 October 2018). "[공식입장] 이나영, 이종석과 로코 '별책부록' 확정…9년만에 안방복귀". News1 Korea (in Korean). ^ Myung-hee Sook (21 January 2019). "'로맨스는 별책부록' 이종석 "올해 입대 예정, 팬들 위해 첫 로코 도전"". My Daily (in Korean). ^ "'로맨스는 별책부록' 이종석 "이나영과 호홉, 난 성공한 팬"". Sports Chosun (in Korean). 21 January 2019. ^ "[공식입장] 이종석, 3월8일 대체복무 "성실히 의무 다할것"". Naver (in Korean). News1 Korea. 26 February 2019. ^ a b Lee, Soo-ji (January 28, 2019). "'로맨스는 별책부록' 일요일 비지상파 전체 시청률 1위". Newsis (in Korean). Retrieved March 30, 2018. ^ a b Lee, Soo-ji (February 11, 2019). "'로맨스는 별책부록' 시청률 5% 넘어섰다, 비지상파 1위". Newsis (in Korean). Retrieved March 30, 2019. ^ a b Lee, Soo-ji (March 4, 2019). "tvN '로맨스는 별책부록' 비지상파 1위, MBN '알토란' 제압". Newsis (in Korean). Retrieved March 30, 2019. ^ Lee, Ye-ji (March 15, 2019). "'로맨스는 별책부록' 이나영-이종석, 서로 달달하게 바라보며…'은단커플'". Top Star News (in Korean). Retrieved March 30, 2019. ^ Yoo, Chung-hee (April 4, 2019). "김서형·염정아·김혜자 등 '백상예술대상' TV부문 최종 후보 공개". Ten Asia (in Korean). Naver. Retrieved April 4, 2019.